You know that feeling when you're flying on an airplane and the plane hits an air pocket and the drop makes you feel like you're wearing your stomach as a hat? Well, you'd be forgiven if December's market volatility generated a similar sensation. And you'd be forgiven again if the recent upsurge caught you equally by surprise. Through last week, the S&P 500 (our best barometer for US stocks) had surged over 10% after declining almost 20% during the recent correction. It's not normal for stocks to do this, but it's not unprecedented either. According to my research partners at Bespoke Investment Group, this kind of move has happened just 12 times since WWII. 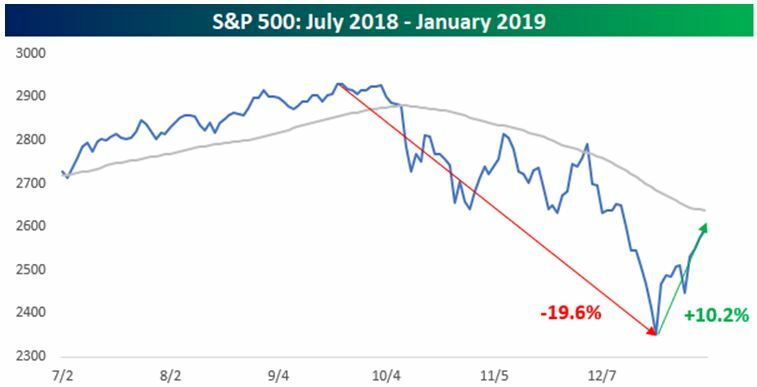 Historically, returns trend higher in the year following these sorts of gyrations but there's also a chance the market reaches what's called a "lower low" during that timeframe. If nothing else, this should accentuate the point that it's impossible to successfully "trade" market volatility. Let's review two more finance terms from the YouGov poll we've looked at in recent weeks: Yield and Mutual Fund. Almost half of Americans polled report little knowledge of both terms. Please don't be one of them. I've always felt a sense of inertia during the holiday season. Thanksgiving passes and then time seems to speed up as the end of the year rapidly approaches. As I've done in prior years, my plan is to take a couple weeks off from writing this blog to spend a little extra time with family. My next post will be on January 8th, but I'll still be working in the meantime. Please feel free to reach out if you have any last-minute needs or burning questions. That next post will also be my Quarterly Update, and we'll recap the fourth quarter in the markets as well as the rest of the year. Who knows how the next handful of trading days will work out, but at this point 2018 seems to be one of those "in with a bang, out with a whimper" years. More to come on that topic. Until then, from my family to yours, Happy Holidays! I hope you get to spend time with family and friends and appreciate the little things that make your life wonderful. Let's review two more finance terms from the YouGov poll we've looked at in recent weeks: Capital Gains and Losses, and Adjustable-Rate Mortgages. Roughly half of Americans polled had little or no knowledge of these terms. Think about that.